Purse seine net fishing is a fishing method to cast the net at full speed to surround the target fish school and haul up the net quickly to catch them. One fleet consists of a net ship, a light ship and a carrier ship. It is operated by a large number of people. The light ship finds a school of fish by detector, sonar or sight, and then, gathers fish by light. The net ship casts nets to widely surround a fish by nets based on the predicted action of fish school and current conditions and wind. After winding the wire on the sea bed side and narrowing the mouth, the carrier follows on the opposite side of the net to scoop up them. Operations are repeated several times in one night, and the carrier travels back and forth between the market and fishing site. Selection of “net fabric” is very important since fishing can continue daily and throughout the year except for moonlit nights. Many types of seine nets have been adopted, from small nets used in waters just off the coast of Japan to large nets used in distant waters (overseas). Nitto Seimo offers purse seine net products that match customer needs with know-how which we have accumulated over many years. The haul depends on such as size of main vessel, sea conditions and geographic conditions, not to mention a target species. 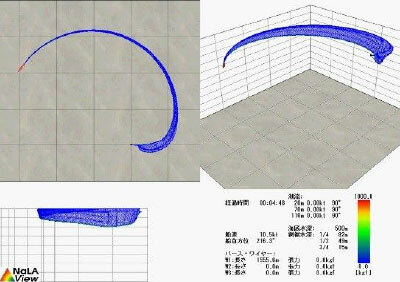 The design of the net is very important because the net should keep good shape while sinking and surround quickly the target fish school. 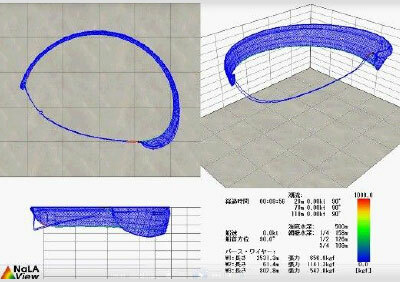 We verify how our designed net settles and drift by simulation software (NaLA system). 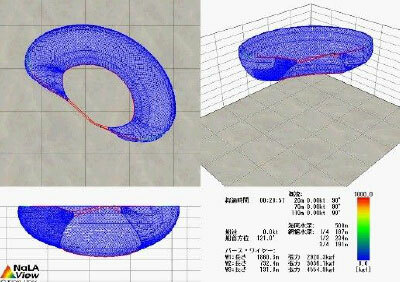 We design a new net with this verification. We also provide some redesign after the verification from your net draft.